"The road to survival could be a dead end." Focus Features has debuted the first official trailer for the latest Jim Jarmusch film titled The Dead Don't Die, a new zombie thriller from the acclaimed filmmaker. This is expected to premiere at the Cannes Film Festival this summer, but nothing has been announced yet. In the meantime, Focus has given us a first look at Jarmusch's latest and it looks amazingly good. Described as a "hilarious" zombie comedy about a small town (filmed in upstate New York) that becomes overrun by the undead. The remarkable ensemble cast includes Adam Driver, Chloë Sevigny, Tilda Swinton, Steve Buscemi, Austin Butler, Bill Murray, Selena Gomez, Rosie Perez, RZA, Caleb Landry Jones, Carol Kane, with Tom Waits and Danny Glover. And Iggy Pop, as a zombie. Oh yes! Fire this one up. The greatest zombie cast ever disassembled! 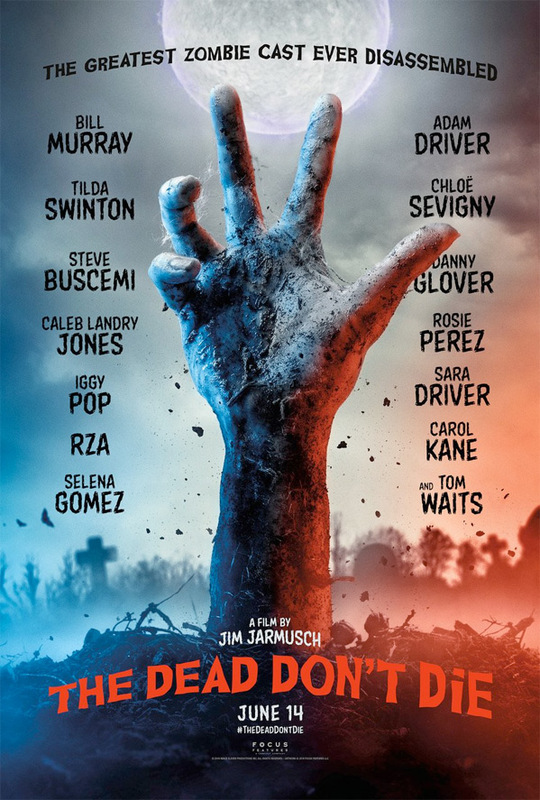 The Dead Don’t Die stars Driver and Murray as local cops who must spring into action when a zombie outbreak begins affecting the town's citizens. The Dead Don't Die is both written and directed by acclaimed American indie filmmaker Jim Jarmusch, director of many great films including Stranger Than Paradise, Down by Law, Mystery Train, Night on Earth, Dead Man, Ghost Dog: The Way of the Samurai, Coffee and Cigarettes, Broken Flowers, The Limits of Control, Only Lovers Left Alive, and Paterson previously. This is expected to premiered at the Cannes Film Festival this summer, but this hasn't been announced yet. Focus Features will release Jarmusch's The Dead Don't Die in select theaters starting June 14th, 2019 in the middle of the summer. First impression? Who's into this?